Last fall ended in heartbreaking fashion for former King Philip star Joe Kellett and the UMass Lowell men’s soccer team. The River Hawks hosted the University of Albany (N.Y.) in the America East championship game at Cushing Field. The game was scoreless into double overtime before Albany’s Andreas Assiotis scored in the 103rd minute to seal a second straight conference title for the Great Danes. The next day, adding insult to injury, the River Hawks found out that they would not be an at-large selection to the NCAA tournament. It was an abrupt conclusion to an otherwise successful season for Kellett, who started all 18 games and led UMass Lowell field players in minutes played. When the season ended, he took time to step back and consider his collegiate career, which included an America East All-Rookie Team selection as a freshman, and he decided to make the move an hour down the road to Chestnut Hill. 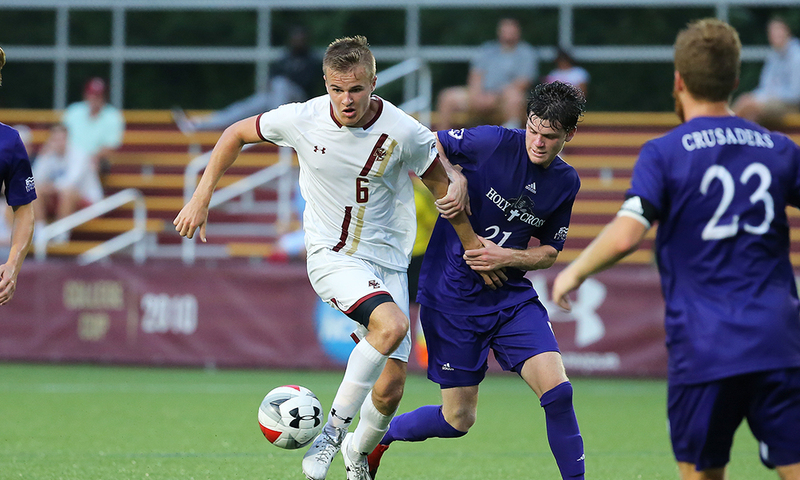 Kellett transferred to Boston College, joining the Eagles in the ultra-competitive ACC to play some of the top teams in the country every game. After electing to make the switch, Kellett completed the transfer during the spring semester, which has allowed him time to get acclimated to his new school, his new teammates, and a new style of play. Over the summer he played with several of the Eagles on the Boston Bolts in the USL League 2 (formerly the PDL). The newly-formed chemistry with his strikers continued into the preseason and his solid play took some of the pressure off Kellett ahead of the new season and earned him a spot in the BC starting lineup. “You have the support from your coaches because they want you to play well and, for me, I was lucky enough that I was able to come in and play well during preseason,” he explained. He has lined up in central midfield in each of BC’s first eight games and has added versatility in the center of the pitch, providing defensive cover when needed but also adding a box-to-box presence when it is called for. That versatility was added to Kellett’s game during his high school career, playing for head coaches Kip Lewis and Nick Gale who not only had different styles of play but also put Kellett into different positions from forward to center back. Kellett mentions “trusting the process” several times during the conversation. He insists that the experience of playing different positions, different styles, for different coaches, has prepared him for the challenge of facing nationally-ranked teams almost every game. Soccer has always been a part of Kellett’s life. He said that his first word was “ball” and that an early age his parents decided that he wouldn’t play football. While he also played baseball and lacrosse growing up, it was soccer that stuck with him. When he was asked to describe what it was about soccer that he liked best, Kellett struggled to come up with an answer. It just became an integral part of his life. Playing for a strong club team, NEFC, Kellett drew early attention from college coaches. He explained that just about every player on his club team ended up on a college team (at various levels) and recruiting started as he entered high school. “I’m happy that I’m out of that process because it’s definitely stressful but looking back it was a cool experience to see which teams want you,” he said. Unlike players in the new full-year academy system, such as the New England Revolution setup or the Boston Bolts academy team, Kellett was able to play for the Warriors and helped KP reach the postseason all four years. Club play was a showcase for his talents and a chance to play against top level competition, but Kellett is grateful he had the chance to represent his school too. “You almost have more pride playing for high school than club, and that translates to college,” he explained. In public school, you’ve grown up in that district for so long that you want to beat the Franklins, the Foxboros, Oliver Ames, but at club you just want to learn and be the best player you can be. Kellett used to drive up to Newton on Friday nights during his high school career and watch BC soccer. Now he gets to line up for the Eagles to take on the best of the ACC. He is more comfortable with the speed of the game, the pressing, the physicality, and now he wants to complete the quest of getting into the NCAAs. Boston College pulled its record back to .500 on the season (3-3-3) with a win against No. 17 North Carolina State on Friday night. Kellett went the full 90 minutes for the Eagles, in their fourth straight game against a team ranked in the top 20.